Is enough done by golf's governing bodies to combat slow play? J B Holmes' Genesis Open win was overshadowed by debate about his pace of play. His final round took 5hr 30min. Ryder Cup-winning captain Thomas Bjorn and Adam Scott are among the players to criticise golf’s governing bodies for not doing more to combat slow play. 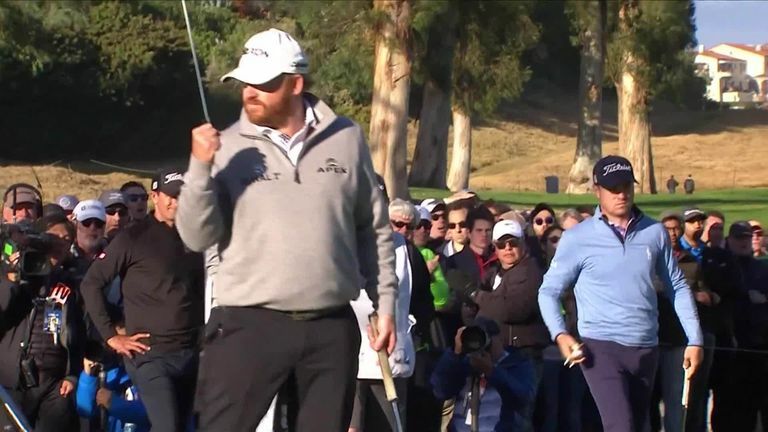 The contentious issue of pace of play returned during J B Holmes' Sunday win at Riviera Country Club, where the final three-ball needed five hours and 30 minutes to get through their final round. Report and highlights from a weather-extended final round at the Genesis Open. Although strong winds in California played their part in a slow Sunday, Holmes' deliberate routine and excessive time taken to play a number of his shots overshadowed the golf in an eventful final day. The American was playing alongside third-round leader Justin Thomas - who let a four-shot lead slip during the final round - and Adam Scott, who was far from impressed with the pace of play during the contest. "I'll tell you my thing on slow play is it's never going to change," Scott said after his round. "I think it's just get over it. Until television and sponsors say no more money, slow play ain't going to change." Holmes was scrutinised on social media by Sky Sports viewers and pundits during the TV coverage, with former PGA champion Rich Beem one of many to call on golf's authorities to clamp down on slow play. Rich Beem says golf's governing bodies need to crack down on slow play. Those views were echoed by Bjorn, who tweeted: "Slow play kills the game of golf. Here we have another Monday when people are discussing the nature of how the game is played and not the people winning the tournaments. Unfortunately the tours won't deal with the biggest problem facing golf." Rich Beem admitted JB Holmes was a worthy winner of the Genesis Open, but called on golf's authorities to crack down on slow play after a marathon final day at Riviera.